My name is Patrick and I am an indie game developer. A couple of years ago I had two different interests that merged into one project. The first interest was about video games. Especially games that on the one hand are entertaining and fun to play, and on the other hand educate the player in some way and confront him/her with a meaningful topic. The second interest was about intensive animal farming also called factory farming. It started after reading the book “Eating Animals” by Jonathan Safran Foer and watching great documentaries like “Our Daily Bread”. The most important insight for me was that animals in this industry are not treated as living beings and their natural needs are completely ignored. Instead they are treated as lifeless material that must fulfill the goal of maximized output. There a lot of things that are worth to mention about this topic. One example is the treatment of piglets; being castrated, have their tails docked and their teeth are often clipped – usually all of this is done without pain-killers. For me there was only the one conclusion: that I just need to do something. The first quite easy step was to become a vegetarian. I even try to live as vegan as possible. The next step was the idea to create a video game related to the topic of factory farming that resulted into the app Bad Karma. Manuel Tiranno (a good friend of mine is) a professional comic author and illustrator. He was excited about my idea and instantly joined the project. 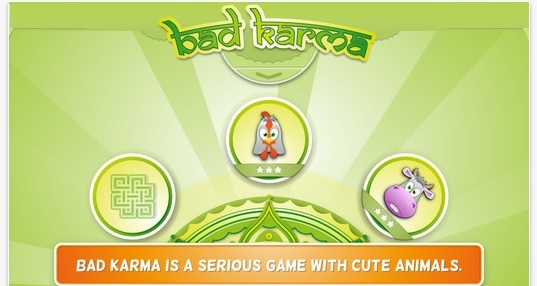 The app Bad Karma is a collection of mini games that represents one aspect of the world of factory farming. It was an intentional decision that the games are not in a happy ending style like rescuing a hen from a cage. Instead they should just be a mirrored image of reality. Currently the app consists of three mini games. In “Egg Collect” the player has to collect eggs from hens in cramped cages. Until a game is over the camera is scrolling endless to the right to symbolize the immense size of the cage. One more detail is that some of the hens are dead already. Shoot cattle with a captive bolt pistol is the goal of “Cattle Kill”. In reality a cattle should be unconscious after getting shot and gets killed afterwards. Sadly many are not unconscious or dead. In this case they hang head down on a hook, bleeding and struggle with their legs. “Chick Sort” is about sorting chicks according to their gender. As only female hens produces eggs, there is no use for the male ones. Therefore the males are deliberately killed soon after hatching. Beside these mini games, we have created some short animated video clips for each mini game that provide some background information and some facts like the number of male chicks that are killed worldwide. 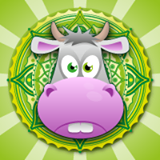 We have also created a wise sadhu (which is a good and holy man) that, after certain events, presents you a nice quote like this one by Mahatma Gandhi: “The greatness of a nation and it’s moral progress can be judged by the way it’s animals are treated”. After almost two years of hard work, we are very happy and proud of our app. For the future we have already a couple of ideas for new content and further improvements. So let’s see what comes next. We hope that we reach and influence many people with our app. And maybe there will be even a blog that starts with the words “Inspired by the app Bad Karma I knew that I just had to do something…”. Peace and love to all living beings. Indie Game Developer. We donate a part of our income to animal welfare organizations. Find them on Twitter! Facebook! You can contact Patrick at badkarma@padasoft.com.